The kitchen is one of the most critical parts of your home, and it deserves the best features, such as a great countertop. Choosing the right countertop for your kitchen, however, might prove to be a challenge with all the options available on the market today. 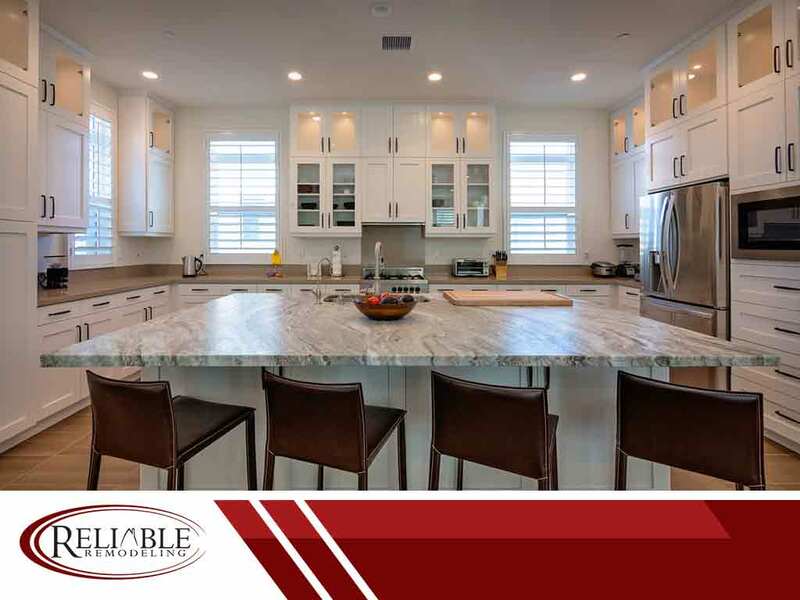 To help you choose the right kitchen countertop, your kitchen remodeling service experts at Reliable Remodeling share some things that you need to consider when selecting this valuable asset for your home. Let’s face it: some countertops are more expensive than others. You should adequately assess your capacity to purchase and install a countertop before making getting your contractor to deliver and install whatever kind you choose. Some materials, like laminate, cost very little per square foot. Other materials, such as granite, are expensive and will require a lot of saving up before making that purchase. Carefully consider your budget before deciding on a kitchen countertop and hiring painting services. Just because a specific material looks and feels good doesn’t mean that it’s the best choice. You will need to consider the reasons for getting that countertop. For example, although marble is great for rolling dough, it is porous and stains easily. It might not be the best choice for families with small kids who love to play with food in the kitchen. Some materials will require considerable effort to maintain their look and durability. If you’re not willing to spend time and other resources on keeping your chosen countertop, better pick one that doesn’t require much maintenance. If you can’t decide on one material, consider using two or more depending on your needs. For example, if your budget allows it, you can opt for a combination of granite and butcher’s block. For a high-end feel, pair your marble counter with a stainless steel island. It all depends on your needs and budget. If you’re looking for a good home addition, a great kitchen countertop is an excellent first step. Please call us at (205) 988-9194 or fill out our contact form to discuss possible options for your home. We serve residents of Alabama, including Hoover and Vestavia, AL.